We all have books that we are reluctant to read, movies we're reluctant to see, or things we're reluctant to do that we know we should tackle. I find that sometimes this is pure laziness but other times it's because I don't expect the experience to be pleasurable; it's a daunting obligation for whatever reason. It's a little like medicine. You take it not because it tastes good but because it will help you get better. 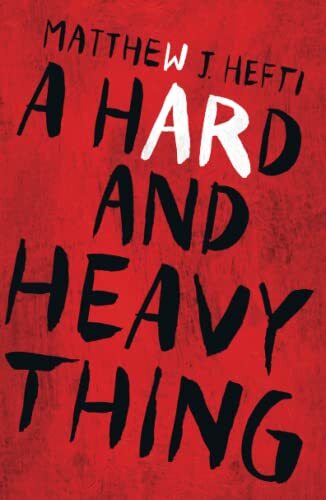 I fully expected Matthew J. Hefti's novel, A Hard and Heavy Thing, to be the book equivalent of medicine. I'd be a better person for having read it but it would be a painful experience in the reading. I mean, it's about war and the devastation it wreaks on the lives of soldiers even once they are back in civilian life. And while it was indeed a painful read, it was pretty magnificent too, far and away better than just taking medicine. It made me face unpleasant truths and it made me think. It made me reflect, it made me feel, and it pushed me, as the best books do. Reading about war is never going to be comfortable but it can be so much more than simply edifying and I need to remember that the next time a book with an uncomfortable topic arrives on my list. Levi and Nick are in high school, drinking and doing drugs, generally wasting their lives in a small Wisconsin town. They have no direction, besides maybe getting Nick's beautiful girlfriend Eris to the ER after an apparent overdose, so when 9/11 happens and Nick suggests that they enlist, Levi agrees easily. If war can be said to go well, theirs does not. They experience so much of what war is: boredom and waiting as well as terror and action, camaraderie and annoyance, power and subordination, life and death, and meaning and nothingness. And once the war is over for them, they each have to return home and find a way to move forward in regular civilian life with the people they love in the small town they thought they'd left behind. The novel is Levi's book, written to Nick to explain their life and how they reached the place they were in. It's a suicide note, an explanation, the love story of their friendship, an apology, an examination, an unburdening, and a meditation. It is mostly in the third person, with Levi writing about himself and Nick from an outsider's perspective until his authorial voice breaks through and he addresses his audience (ostensibly Nick but also the reader) directly, philosophizing about the action and what it all meant in terms of their relationship, making sure that he was not misunderstood because of the goodness of Nick's heart. It is honest and hard. And although fiction, it feels like nothing so much as truth. Broken into three distinct sections, before, during, and after the war, the novel addresses such huge issues as guilt, suffering, PTSD, love, hope, and hopelessness. Nick and Levi are hard to like much in the beginning, just dumb, bored teenagers wasting their lives. But war changes everything and their essential selves solidify in surprising ways, making them more complex and more sympathetic. Hefti starts the novel with the boys taking Eris to the ER, worried she is dying and the narrative tension slowly escalates from there through Iraq and Afghanistan, and all the way back home as well. This is a powerful story that asks if absolution or redemption is ever available. What if the official take on events is undeserved? What is a normal life, especially after a life changing experience or tragedy? What is a human life worth and who is the judge of that? What is a friendship worth and how many betrayals can it survive? Ultimately thoughtful and heartbreaking, this novel shows us that both war and the heart are hard and heavy things. And Matthew Hefti has allowed the reader a glimpse into both. A National Reading Group Month Great Group Read for 2016.